Sprint and HTC Corporation today announced summer availability of the world's first 3G/4G Android handset, HTC EVO 4G exclusively from Sprint. HTC EVO 4G delivers a multimedia experience at 4G speeds that is second to none, making it possible to download music, pictures, files, or videos in seconds - not minutes - and watch streaming video on the go with one of the largest pinch-to-zoom displays, at 4.3 inches, in the wireless industry. Sprint 4G offers a faster wireless experience than any other U.S. national wireless carrier, and Sprint is the only national carrier offering wireless 4G service today in 27 markets. Sprint 4G delivers download speeds up to 10 times faster than 3G1,giving HTC EVO 4G the fastest data speeds of any U.S. wireless device available today. "Sprint continues to lead the 4G revolution as we introduce HTC EVO 4G to give our customers an experience that is unlike anything available in wireless to date," said Dan Hesse, Sprint CEO. "Not only is this feature-rich device incredible on our Sprint 3G network, but Sprint 4G speeds will take mobile multimedia, including live video streaming, gaming and picture downloads, to a whole new level." "HTC and Sprint have a strong history of working together to bring consumers technologies and advancements that make their lives easier," said Peter Chou, CEO of HTC. "We believe that the HTC EVO 4G represents the best of Sprint and the best of HTC working together to bring an unmatched device to the U.S. This combination of HTC and Sprint innovation will allow people to do even more while on the go, faster than ever on the Sprint 4G network." 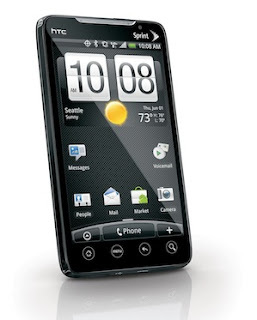 Customers will be able to purchase HTC EVO 4G through all Sprint channels and through national retail partners, RadioShack, Best Buy and Walmart, this summer. Pricing will be announced at a later date. Pre-registration begins today at www.sprint.com/evo. You can read the full version of today's announcement on the Sprint website. Moto Droid 2.1 Update: Is it Out? Rumor: Will Apple's iPad Launch Be Delayed?